(L-R): Mike Potter, production superintendent of Highway Contractors; Jake Kerl, vice president of Highway Contractors; and Jim Ellison, general superintendent of Highway Contractors, meet with Britt Stubblefield, Kirby-Smith Machinery territory manager. “Britt and Kirby-Smith do an outstanding job of taking care of our equipment needs from all standpoints — sales, rentals, service and parts,” said Kerl. The history of Highway Contractors Inc. is long and varied. It includes changes in names, ownership and types of work. But, one thing has remained nearly constant through more than five decades — the Adams family lineage. 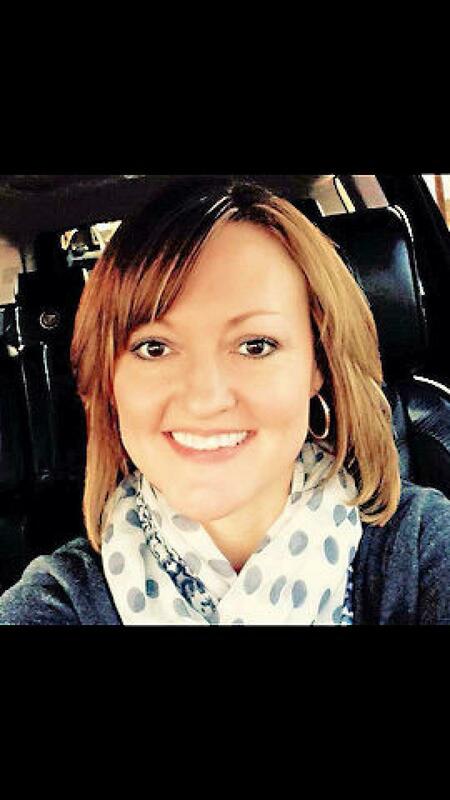 Adams and her nephew, Jake Kerl, are the current owners of the Guymon, Okla.-based business, which today mainly focuses on state, municipal and county asphalt overlay projects throughout Oklahoma. It also does some work in Texas and Kansas. Kerl joined the company full-time approximately four years ago and is the vice president. That's somewhat been the case since Ashley's father, J.R. Adams, founded the company, along with some partners in the early 1960s, that would later become Highway Contractors. Known then as J.R. Adams Inc., its mainline offering was excavation. During its early years, the firm helped construct several miles of Interstate 40 across Oklahoma. Mike Potter, production superintendent, started as an operator with the company in 1973 and witnessed its transition from earthwork to asphalt. Nearly a decade after Potter joined the company, Highway Contractors purchased its first asphalt plant, which is still in operation today at its Guymon headquarters. 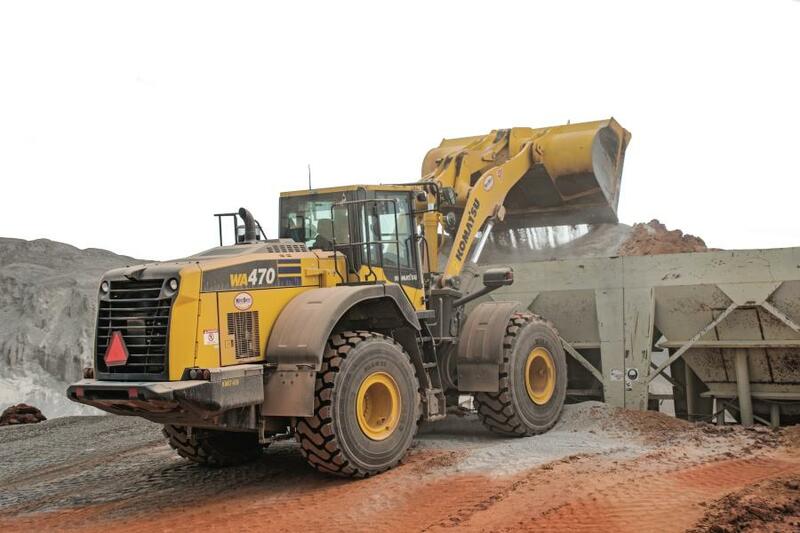 The business also has a portable plant that it moves on-site for projects with a sizeable amount of asphalt. Eventually, a change to the Highway Contractors name occurred in addition to a shift in ownership. In the mid 1970s, J.R. and his wife, JoAnn, became the sole owners of J.R. Adams Inc. They would sell it to another individual who ran it for just a few years before JoAnn bought it back in 1979. Ashley and Junior bought shares in the firm in 1998, and they operated Highway Contractors with JoAnn until she passed away in 2013. Davidson died a couple of years later, and Jake purchased his shares. Now, Adams handles billing, accounts payable and other inside items while Kerl runs the field operations. Highway Contractors has several other long-time staff members. During peak season it employs around 30, including Jim Ellison, general superintendent. The company is able to keep about half of its workforce when work slows during the winter months. The company typically operates within a three- to four-hour drive of Guymon, which is located in Oklahoma's panhandle. Recent projects took a crew into Texas where it completed a 77,000-ton overlay on Highway 54 from Texhoma to Stratford. In western Oklahoma, Highway Contractors finished three jobs on Highway 183 near Taloga that together totaled nearly 150,000 tons of material. 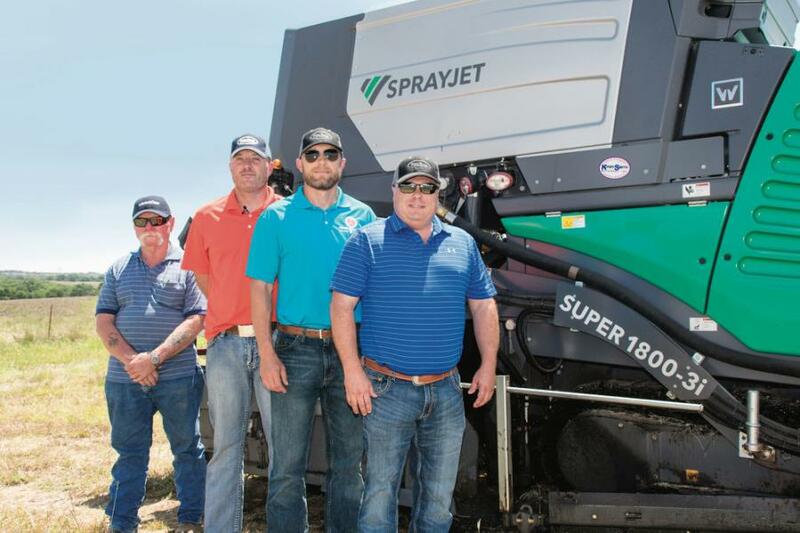 The company set up the portable plant on the outskirts of town and put it into action along with a brand new Vögele Super 1800-3i SprayJet paver — a Wirtgen Group product that it purchased from Kirby-Smith Machinery with the help of Britt Stubblefield, territory manager. 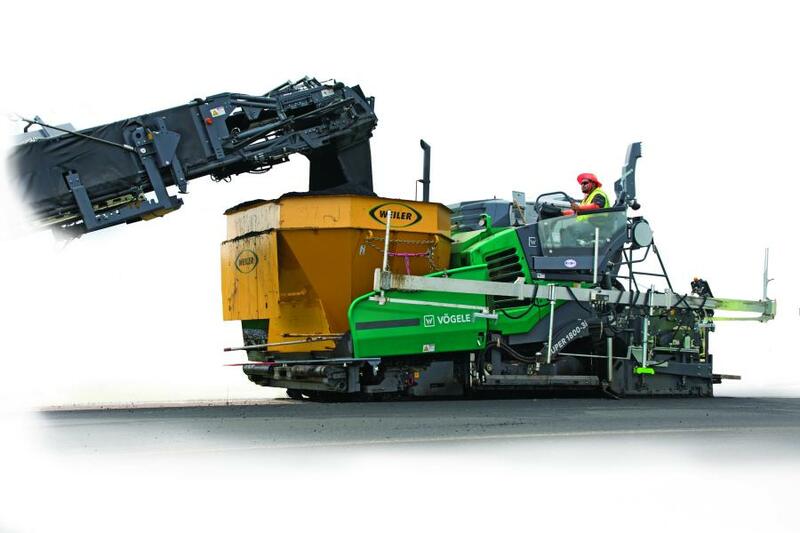 The unique 170-horsepower (156 hp in ECO mode) Super 1800-3i SprayJet can be used for paving thin asphalt overlays as well as for conventional binder and surface courses. With this machine, operators can spray a thin layer of tack and go right over it with asphalt. The Super 1800-3i has a maximum spray width of 19 ft., 8 in., with the emulsion tank holding up to 550 gal. It paves up to the same width and can go to nearly 30 ft. with extensions. The hopper capacity is approximately 14 tons. 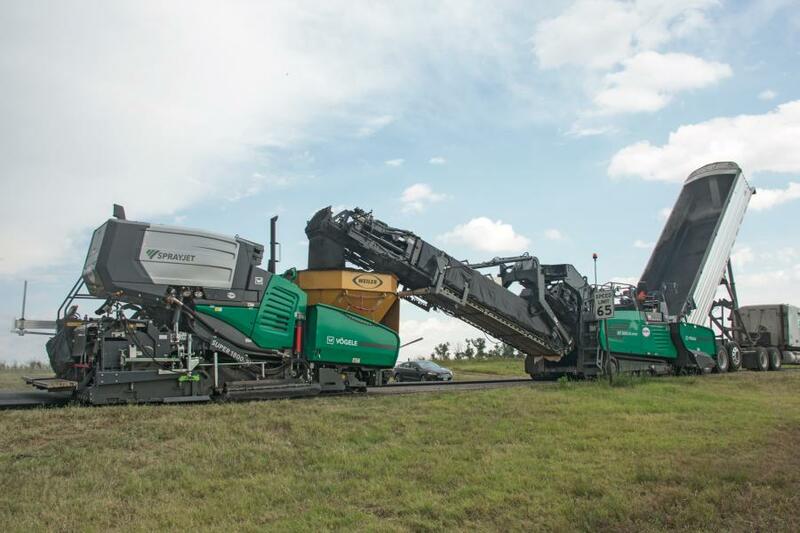 Highway Contractors used the Super 1800-3i SprayJet in tandem with a Vögele MT3000-2i Offset PowerFeeder material transfer feeder it rented from Kirby-Smith and Stubblefield. 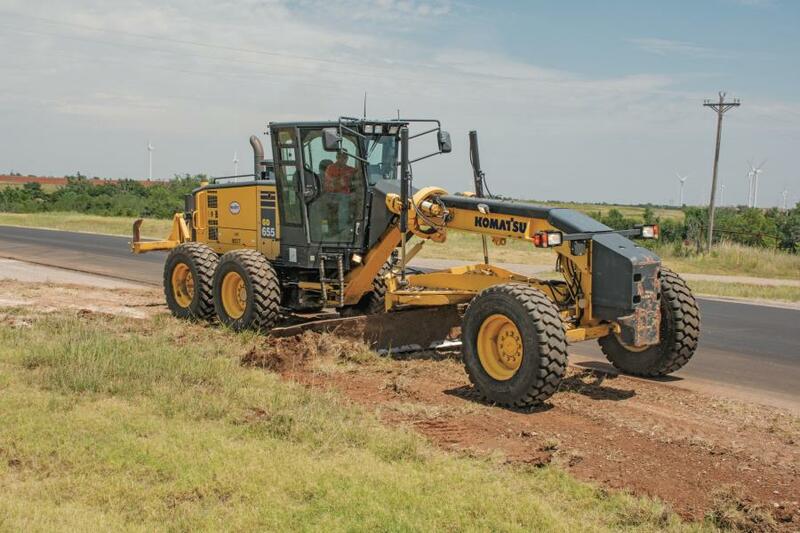 The company occasionally rents a Wirtgen stabilizer as well and has purchased several Komatsu products, including WA470 and WA380 wheel loaders and a GD655 motor grader it uses for “light-duty” dirt work such as knocking down shoulders and trimming grade. In addition to Wirtgen Group and Komatsu machinery, Highway Contractors has purchased and rented Trail King trailers and other products from Kirby-Smith. 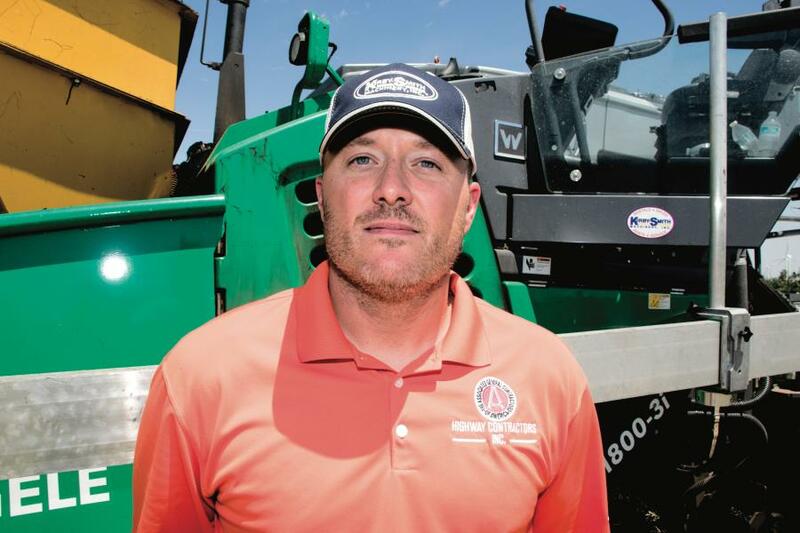 Highway Contractors works one job at a time, and the owners would like to see the number rise. Another probability might be branching out into other markets.